Cameras help you see what’s happening at your home from wherever you are. Are the kids doing their homework when they get home or are they playing video games? Has someone taken that package that got delivered at home while you were at work? Can you instantly check on your home when you get the call that the alarm system has been activated? Or, maybe you discovered that $40 is missing from your desk. Was it one of your kids? The sitter? An intruder? Or are you just getting forgetful? With the right kind of recording equipment, you would know who it was, what happened, and what to do about it. Home security cameras are not for everyone. There are plenty of less costly actions (such as better locks, a burglar alarm system and other precautions) you can take before considering these. However, if you have a specific area of concern (such as a previous attempt at a break-in, vandals in the back yard, or just seeing who is at the front door) cameras and recordings can give you indisputable proof and a reassuring feeling of knowing what is going on. There are many manufacturers of security camera systems (also called Closed Circuit Television, or CCTV) in the market today. How do you choose which is correct for you? Northeast Security Solutions has researched the industry to save you time and money. A recent survey in the Closed Circuit Television industry noted that 87% of purchasers did not have their visual expectations met after their systems had been installed. Northeast Security Solutions, Inc. will help you design a system that will meet your expectations. Is an IP based or traditional analog technology best for your needs? How much recording time do you need: days, weeks, months, years? Do you want the ability to check your system from a computer, smart phone, or tablet? What are the legal aspects associated with using the information you have recorded? 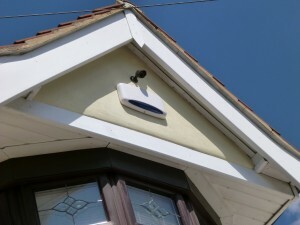 What are the moral and ethical issues involved with home cameras and recordings? Can you use this information to prosecute an intruder? Northeast Security Solutions has the experience to help you answer these questions and help you select the system that is right for you. There are many options when choosing security cameras. One of the first things you’ll need to decide is whether your system will be cloud based or recorder based. With a cloud based system, the cameras in your home transmit data to servers. Offsite access is provided through the internet on your smart phone or your computer. The advantage of this system is the footage is off site so there are no worries about someone stealing or destroying the recorded footage. The cost of purchasing a recording device is also eliminated. The drawbacks with a cloud based system are the monthly service and storage fees as well as the limit to the number of cameras you can place on the system. In addition to not requiring monthly service fees, recorder based systems also tend to have better options for searching through recorded footage. With a recorder based system, either a Digital Video Recorder (DVR) or Network Video Recorder (NVR) is installed in your home and the cameras are wired to that device. You can still view the footage from your mobile device or computer from anywhere through a DDNS service if a DVR or NVR is connected to the internet. But with this system, there are no monthly fees, only the initial cost to purchase the system. Searching through recorded footage tends to be easier on a recorder based system and if you’re planning on installing more than 4 cameras, a recorder based system prevents multiple logins to see your cameras. 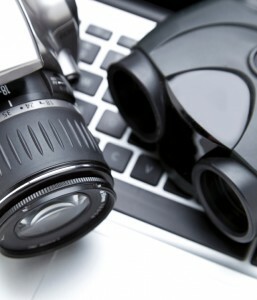 In addition, if you have concerns with your data being “in the cloud” a recorder based system doesn’t need to connected to the internet to record footage, which can eliminate that concern. Both system types have their advantages and disadvantages and the security professionals at Northeast Security Solutions can help you navigate your options to help you choose the best system to meet your needs and your budget. You may have also heard that surveillance cameras can be analog based or IP based. While IP cameras are the newer and more advanced product of the two, analog cameras still offer great cost savings and efficiencies that still make them the more commonly used product. IP cameras can offer much greater image quality, typically 1-5 MP of resolution. However, that greater image quality comes at a higher cost. In addition, higher resolution images means higher volumes of storage will be needed to store your footage. However, a single IP camera with high resolution can possibly replace up to 3 or 4 analog cameras under the right circumstances, making IP systems more cost effective in some situations than Analog camera systems. Analog cameras are the tried and true technology, but they are limited in image quality. The cameras cost less and still offer picture quality that is acceptable for most situations. However, high end features like video analytics and some integration features aren’t possible with analog cameras. Our staff can help you navigate the options and help you decide what system type makes the most sense for your situation and budget. Contact us for a free quote today! What About the Cheap Camera Kit at the Local Warehouse Store? If you’ve been tempted by the kits at the warehouse or hardware stores or on the Internet, you should know that they don’t provide the same quality that you get from a professional system. You may find shortfalls in these types of systems that our experts can avoid when designing a customized surveillance camera system.